It's amazing to know that most gadgets including cars and household furniture today are stamped with the "environment-friendly" seal. I hope that one of these days, everything and anything that we deal with is no longer a threat to our nature. So, what is so special about this rocking chair? It is kind of weird because it has its own attached lamp which if you will look closer, doesn't seem to make any difference at all. Well, it's my honor to tell you that it has one amazing feature that I am sure will leave you dazed. This rocking chair that is invented by Rochus Jacob from USA is called Murakami chair. The chair's attached lamp is supplied by the kinetic energy produced when it skids back and forth. 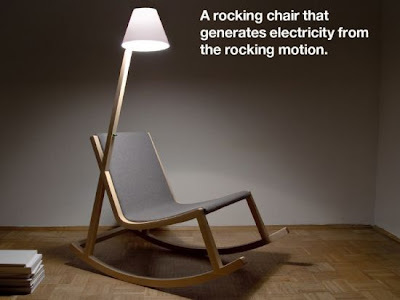 Yes you've heard it right - the rocking chair self-generates enough power to light up the lamp. The concept made use of advanced nano-dynamo technology to power the OLED lamp. The OLED lamp also is designed to have sensors that determine if the room is well lighted or not. So that during the day, the OLED lamp stores the energy on the battery pack which is ready to be used when the night falls. It is indeed a one great advocacy in the conservation of energy. Kudos to Rochus Jacob!